First ship in the Quantum-Ultra class delivered on schedule to Royal Caribbean International in Bremerhaven. Today MEYER WERFT handed over Spectrum of the Seas to Royal Caribbean International. The first cruise ship of the Quantrum-Ultra class has a rating of 169,000 GRT; it measures 347.1 m in length and 41.4 m in width, with capacity for 4,246 passengers. Like its sister ships Quantum of the Seas, Anthem of the Seas and Ovation of the Seas, MEYER WERFT's youngest new-build has the glass capsule North Star, the Flow Rider surf simulator and the Rip Cord skydiving simulator. New features include the Sky Pad, a virtual reality, bungee trampoline experience located on the aft of the ship. 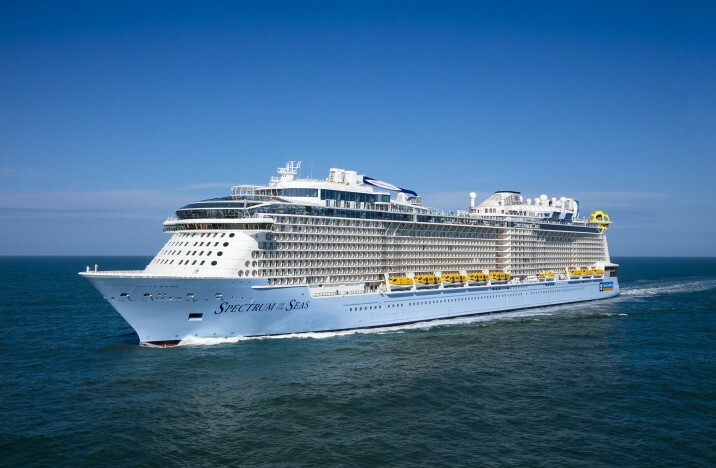 As a further development of Quantum-Class, Spectrum of the Seas like its three sister ships is fitted with state-of-the-art emission control systems such as the so-called hybrid scrubber. Highly energy-efficient technical systems, optimized hydrodynamics, heat recovery and exceedingly effective underwater paintwork together with an extremely energy-saving LED lighting system result in considerable energy savings. A diesel/electric pod drive, extensive alarm and safety systems, interactive communication systems and the very latest stage equipment guarantee safety and entertainment on board in accordance with the highest technical standards. The cruise ship has altogether 18 decks with 2,137 cabins offering space for 4,246 passengers in double occupancy. After being handed over to the shipping company, Spectrum of the Seas will be leaving Bremerhaven. The maiden voyage to Asia will begin in Barcelona on 18 April.